As ubiquitous as Amazon is in some people’s lives, it’s still just a tiny fraction of the world’s retail sales. 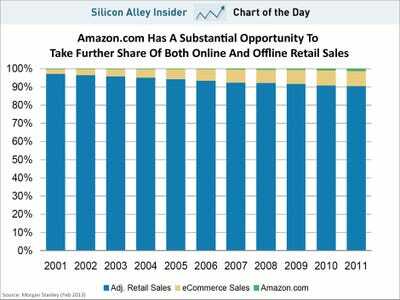 Heck, it’s still a tiny fraction of e-commerce. This chart from Morgan Stanley puts into context the huge opportunity for Amazon to take more share away from traditional retailers.